Laina Simone (center) spoke with Maureen and Forrest Armentrout in Danvers about a ballot drive to drop Common Core in Massachusetts. DANVERS — Common Core education standards have become a political football across the country, with Republican presidential candidates scrambling to distance themselves from guidelines that set goals for what students should know by the end of each grade. But in Massachusetts, there has been limited debate, even amid efforts to use a November ballot measure to scrap requirements the state adopted in 2010. And grass-roots organizers of the push face powerful opponents as they seek to win over voters, at a time when efforts to lift the state’s charter school cap have dominated the Massachusetts education debate. Supporters of the voluntary standards, including top state education officials, say dropping them and redeveloping previous standards would waste money and time. The state’s educational frameworks, they say, reflect the best of both Common Core and older requirements that made Massachusetts tops in the nation in education. Critics say Common Core is weaker than previous Massachusetts standards and in many areas is not appropriate to children’s developmental stages. Supporters of the ballot measure easily cleared the initial hurdle of gathering 64,750 signatures last fall. If the Legislature does not act on the issue by May 3 — which seems unlikely — supporters would have until July 6 to collect about 11,000 more signatures required to put it on the ballot. To garner public support, critics of the standards are canvassing the state. 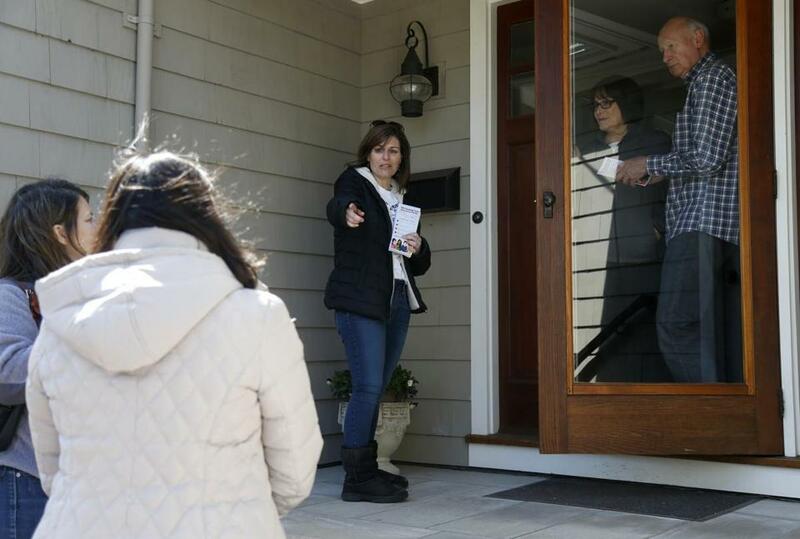 Laina Simone, a candidate for the North Reading School Committee, was among dozens of parents and teachers who knocked on doors in Danvers, Wareham, West Springfield, and a half-dozen other municipalities over the weekend. “We see what’s going on with education, and quite frankly it’s horrifying, especially given that Massachusetts was number one in the nation,” Simone said on the Danvers porch of Maureen and Forrest Armentrout, who were receptive to the pitch. She said her son-in-law, an engineer, has difficulty helping his daughter with eighth-grade math homework. Some say Common Core-directed approaches to math are counterintuitive. For Simone, as for many in the effort, it is deeply personal. Her eighth-grade daughter, who learned under previous state standards in the early grades, has a clear advantage in comprehension over her daughter in the fourth grade, who has studied under Common Core standards from the beginning, Simone said. Canvasser Maria Andrade, a fifth-grade teacher in Peabody, said the standards have created frustration among her students. “I feel like their confidence in their ability to do things — particularly in math — has dropped drastically,” Andrade said. A February WBZ-UMass poll found that 53 percent of 891 registered voters surveyed would support the ballot initiative, while 22 percent opposed it. Another 25 percent were unsure. But those numbers could shift dramatically by November, said Peter Ubertaccio, a political science professor at Stonehill College. “If the pro-Common Core people put a lot of money behind this, then the anti-Common Core folks are going to need a high-profile backer like the governor, and they may not get it,” Ubertaccio said. Governor Charlie Baker, who testified against adopting Common Core when he unsuccessfully ran for the office in 2010 and spoke critically of the standards during his 2014 campaign, has been quiet on the subject since taking office. Donna M. Colorio (right), chairwoman of End Common Core Massachusetts, organized a canvassing effort with Agatha Bodwell in Danvers on Saturday. The repeal effort may not be able to count on teachers unions, either. The Massachusetts Teachers Association has taken no official position on the ballot question, despite its president’s past denouncements of Common Core. Opponents could be outspent by the group seeking to retain Common Core. The group, Committee to Protect Educational Excellence in Massachusetts, is led by Robert Antonucci, a former Massachusetts education commissioner. A spokesman for the committee said it does not yet have a budget. Donna M. Colorio, chairwoman of End Common Core Massachusetts, said her group would need more than $100,000 to be successful on the ballot, and has raised about $35,000 so far. Colorio said she expects to be heavily outspent. The repeal effort could also be shut down in court. In May, the Supreme Judicial Court is set to hear an appeal of the attorney general’s certification of the ballot measure that contends it violates the state Constitution. Common Core standards were developed by the Council of Chief State School Officers and the National Governors Association, with funding from the Bill & Melinda Gates Foundation, whose education reform agenda has been controversial. The Obama administration encouraged states to adopt Common Core, giving preference in its Race to the Top educational grant program to states that embraced shared standards. Massachusetts received $250 million in federal money after adopting the standards. The standards are in use in 42 states and Washington, D.C., according to the Council of Chief State School Officers. But several states that initially embraced them have backed away. Part of the conflict is ideological. Common Core opponents say the standards are government overreach, because they were developed and adopted by states with encouragement from the federal government. Antonucci, leader of the committee that’s opposing the ballot measure, said politics should not drive education policy. “Politicizing of the frameworks and of education, to me, is detrimental to its future,” he said. Critics of Common Core say the standards have pushed Algebra I classes from eighth grade to ninth and shifted the focus in English from reading poetry and fiction to more nonfiction and informational texts. “The kids are not developing the vocabulary, the critical thinking,” Colorio said. Supporters of the standards dispute those claims. Mitchell Chester, the state’s commissioner of elementary and secondary education, who participated in the development of the standards and recommended their adoption, said the state’s education frameworks, which add expectations beyond those established by Common Core, are working for Massachusetts students. Ariel Maloney, an English teacher at Cambridge Rindge and Latin School, said that under the current standards she teaches as much literature as at any point in her 10-year teaching career. What has changed, she said, is that science and social studies teachers are treating their texts as areas for improving reading skills. “It shifts the idea of teaching literacy to teachers across disciplines, instead of just requiring English teachers to teach literacy skills,” Maloney said.